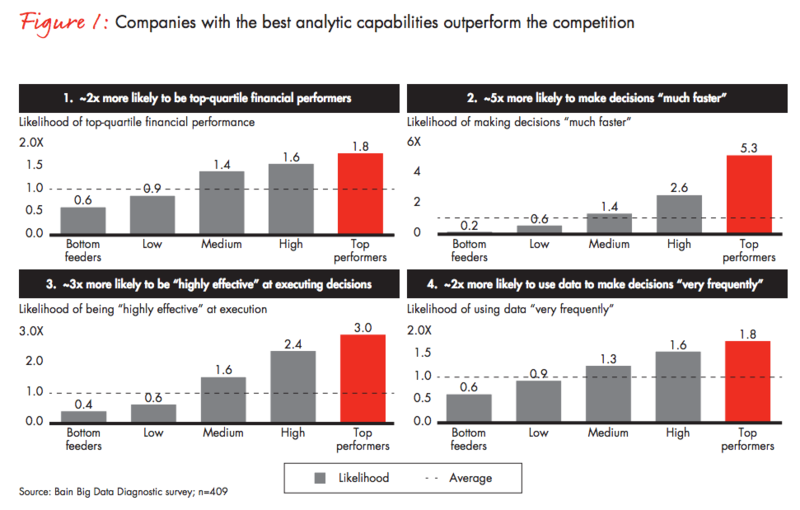 A 2013 report from Bain found that top performing companies are both twice as likely to use data “very frequently” to make decisions and five times as likely to make decisions faster than their market peers. Also, companies that pay attention to what their customers are telling them are more apt to continue making products people actually want. As a result, we’ve seen the rise of the Chief Data Officer (CDO), and many companies are making a commitment to vigilance regarding the use of data in marketing and product development. But What Does A Chief Data Officer Do? Forrester surveyed 3,000 companies and found that 45% of companies have assigned someone to oversee data strategy. In younger companies, especially, data management may not always rise to the c-suite. Instead, this tends to become the responsibility of a Software Engineer, a Product Manager, a Head of Analytics, or a Growth Hacker. Identify opportunities for innovation across the entire customer journey. Focus the business on revenue generation activities. Develop and implement an enterprise-wide reporting solution for KPIs. Meet regulatory demands and manage risk. Cultivate cross-functional relationships between business units to ensure insights become actionable. Ensure data is in a clean, consistent, accurate and actionable format for the rest of the company to easily use. Demonstrate ROI through data collection, enrichment and integration activities. These data-driven organizations all realize that a well-defined process around data collection and management improves the company’s ability to model revenue, develop desirable products and a whole host of other activities. In early 2014, Gartner published this advisory report which urges Chief Information Officers (CIO) to get involved in defining the CDO job description and reporting relationships. This same report also reminds us that the CDOs do not “own” the data. Rather a CDO is analogous to a Chief Financial Officer (CFO), wherein the CDO owns a few things, like the schema perhaps, but they are expected to coordinate the use of data by other teams. According to Paul Gillin of SiliconANGLE, “Uber and Netflix are data-driven at their core; that’s their entire business. They don’t need a CDO when everyone is effectively doing that job already.” We’ve seen that at Segment, too. Many of our customers have one person in charge of the data strategy and keeping the execution tidy. Some of our biggest customer advocates have a title like Head of Analytics or VP of Growth while others are a Data Architect or Growth Hacker. Assigning someone to be responsible for defining the schema, selecting the tool set and ultimately empowering them to prove their own ROI is an essential step toward businesses maximizing an investment in data. Without clear authority and processes, data becomes muddy and untrustworthy as different teams look at their respective tools and draw different conclusions. For example, you’ve probably heard this type of question: “Why does Mixpanel say there were 3,000 signups when Google Analytics says there were 3,400?” Debugging data discrepancies is time-consuming, and costly. When someone has clear ownership over the way data is collected and routed, these sorts of situations can simply be avoided altogether. Create a data dictionary. This asserts a specific syntax and the uses of event-level data. A tracking plan is a good place to start. Make sure this is in a publicly-accessible location, no passwords allowed. The aim is to make this a standard reference point for everyone who engages with the data you collect. Be adamant about formatting. Make sure everyone in your company has a guide for how event data should be named and implemented. Being strict about using a certain format, whether that’s verb-oriented (Viewed Ticket) or object-action (Account Created), is the only way you’ll have clean, easy to use data in all of your dashboards. Even simple cAsiNg can mean the difference between clean, trustworthy data, or a real mess. Start small. It’s easy to track too much; avoid becoming overwhelmed (and radically high technology licenses) by limiting the number of events you track. You can always add more tracking later. Start with the most important questions you have, and track only what you need to answer them. It takes a village. Educating the core product engineers on your data strategy leaves them in charge of their own codebase and focuses the data team on compliance with the data dictionary and meaningful analysis. Build dashboards. Making data visible is one sure-fire way to help others. Partner with business stakeholders to understand what they want to know and deliver that in short order to get more people on your side. Protect the integrity of the system. Above all else introduce changes in an orderly fashion and build a process around collecting new types of data. The efficacy of your data hinges on your ability to collect it in a consistent, controlled, manner. When people trust your data, you win. When I asked Jon for an example of a data-inspired feature, he told me about The Knot Wedding Planner App. The app is pretty robust with impressive features to budget for your wedding, find and communicate with vendors, and all sorts of other things that help couples “tie the knot” in style. A recent analysis yielded some interesting results. The red arrow shows a feature of the app that was discovered to have incredibly high retention correlation across all cohorts of users. Billions of API calls pass through Segment to a Redshift database (and a variety of other integrations) that allow Jon’s team to use SQL to run some queries and visualize the data in Mode. This starburst analysis made it obvious that there are some very common user actions in the app. With that insight, they dug deeper using Mixpanel to identify the specific features that had proven to be so popular. It turns out, a surprising number of users were coming back, day after day, to look at their Wedding Countdown. 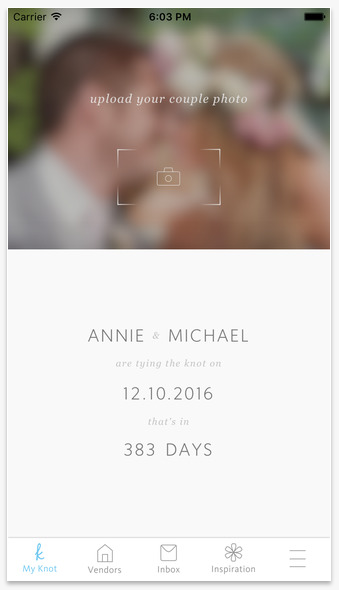 This wedding countdown is a popular feature among repeat visitors. Jon said, “The starburst tipped us off that an easter egg feature in our UI may be encouraging some awesome engagement. So we looked at the related screen views and how frequently users came back just to view that screen. It turns out it has huge retention value for us. As each day goes by an overwhelming percentage of users will come back the following day and see how many days are left until their wedding in an unprovoked way (no email, push, etc. ), similar to how one would check the weather.” The analytics team at The Knot had discovered this simple feature was a huge asset! 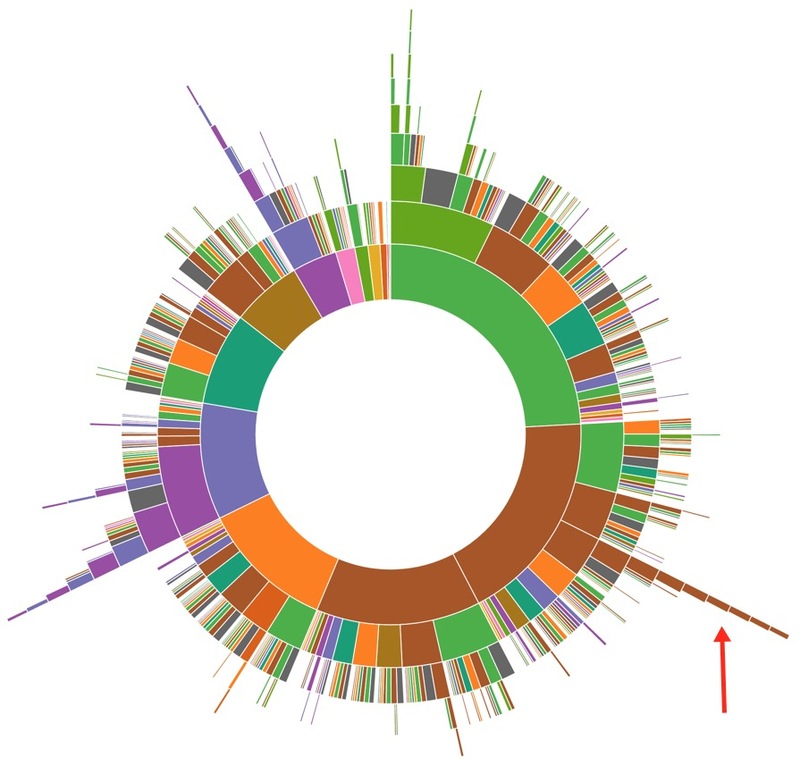 The colors show cohorts of users who return to the app after 1, 2, 3, etc days. The majority of users will return multiple times within the same week and engage with this feature. Jon continued, “This analysis taught us that a very simple feature was bringing people back to our app again and again. Most apps don’t have that kind of stickiness.” Understanding this user behavior has inspired updates to the UI that will consider metadata like the wedding date and location to make smart, machine-learning powered, recommendations that should help our users discover even more value from the app in a way that is natural and helpful. Companies with data in their DNA seem likely to experience even greater ROI if they nominate a Data Czar–someone to control the data collection and management protocol. For those companies lagging behind, but ready to catch up, it may require making room at the executive table for a Chief Data Officer. And Segment is here to help you, regardless of your title.